“Though sunk in death the forms the poet drew, the actor’s genius bade them breathe anew; though, like the Bard himself, in night they lay, immortal Garrick call’d them back to day,” reads the epitaph on Garrick’s tomb in Westminster Abbey. 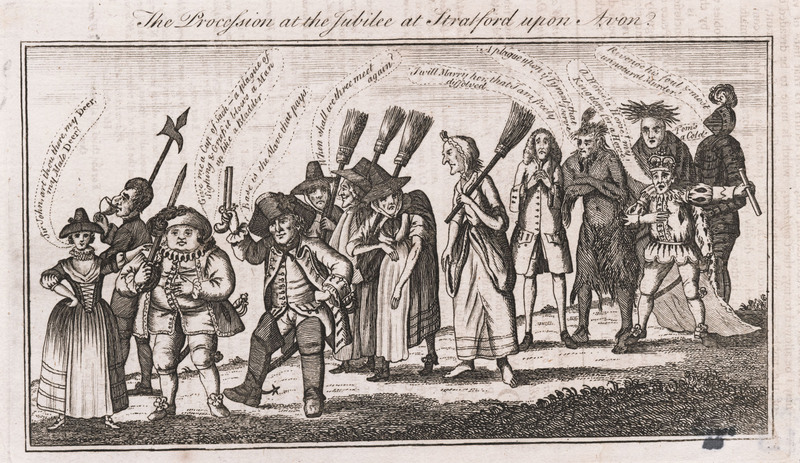 And Garrick’s festival of 1769 did call Shakespeare’s characters on to stage, in a series of processions or “pageants” of key scenes from the plays. Rain forced the cancellation of the original processions, planned for the Stratford Jubilee. These were nonetheless elaborately staged in London, at the Drury Lane Theatre, and illustrations of the processions were included in descriptions of the Jubilee itself. Two engravings, on loan to the Remembering Shakespeare exhibition from Yale’s Lewis Walpole Library, capture something of the spectacle of this performance. The first, shown below, brings us thirteen characters, ogling their readers as they march, with almost uniform glumness, across the page. But who are they? Most characters are easily recognizable; others, less obvious, are explicated by the British Museum’s Catalogue of Prints and Drawings. Mrs. Ford plants a proprietary hand on Falstaff’s shoulder, reciting “Sir John, art thou there, my Deer, my Male Deer,” from Merry Wives of Windsor, to which Falstaff replies, from Henry IV Part One, “Give me a cup of sack—a plague of sighing & Grief it blows a man up like a bladder.” Mid-march, the three witches grumble “When shall we three meet again” and, bringing up the rear, Hamlet’s father groans again to “Revenge his foul and most unnatural murder!” Caliban and Richard III make their way here, alongside characters from Lear and Henry V.
But why these? We’ll return tomorrow to the Continued Procession, to see who did and didn’t make the B list of Shakespearean characters.